The workshop will include theory on basics of entomology and conservation importance of insects, classification upto Orders, data collection on field, collection, preservation, mounting and display of specimen, tools (equipment) of the trade, introduction to taxonomy of specific groups through the use of stereo-microscope, session on photo-documentation, future prospects in entomology from the amateur and professional perspective, networking and use of social media. 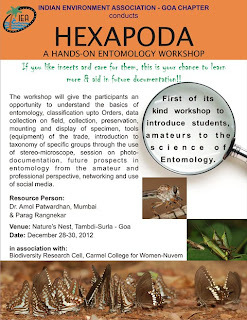 The participants will be guided by Dr. Amol Patwardhan, an entomologist based in Thane with special interest in butterflies & beetles and Mr. Parag Rangnekar, a naturalist based in Goa with special interest in butterflies & dragonflies. Desiring candidates will have to fill an “Application Form” and submit to Mr. Parag Rangnekar (rangnekarparag@gmail.com) on or before November 05, 2012. The selected candidates will be announced on December 01, 2012 and informed via email. Selected candidates will be charged a nominal entry fee of Rs. 200/- only. The workshop is supported by the Indian Environment Association-Goa Chapter. Participants from outside Goa will be charged a minimum fee of Rs.1,000/- only. The workshop will have not more than 22 participants. The participants will be issued certificates at the end of workshop in association with the Biodiversity Research Cell, Carmel College for Women, Nuvem.